The sign of good things to come! The Z emblem on the front fenders is back lit and doubles as an extra side marker light. It even flashes with the high beams, pretty cool! Our wish was fulfilled when our friends at Edmonds.com invited us for the first public unveiling of the car at Chiat-Day, Nissans main ad agency. Not only would we be able to look, touch, feel and photograph the new Z, but we would be able to crawl around them as well. Unlike other publications we can do so with the eyes of an automotive engineer and attempt to fill in some of the blanks about the car. In this first go around we will be doing some educated guesswork, but we will be interviewing some of the people behind the development of the car to get more accurate information which we will be writing about right here at 370z.com! 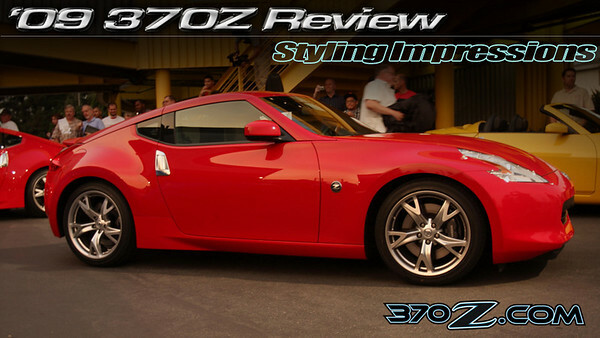 We were impressed when viewing the new Nissan 370Z. The styling has visual cues dating back to the original 240Z. You can see the 240Z's DNA in many places in the 370's design. The 240's heritage echoes the most strongly in the rear quarter windows. The 370Z's sleek silhouette is defined by these upswept quarter windows that are echoed by the dynamic upward curvature in the lower rocker panel. Hints of the original are also seen in the front fascia around the front grill opening, the character lines of the hood and the boomerang shaped HID headlights. Hey my name is sandra and i just got a 370z and i LOVE it. Its great. i love going fast its nicceee. :) i want to get turbo in it but im not sure... what do you think ??? I think it's perfect the way it is. MOST AMAZING THING EVER I WANT ONE SOOOO BAD AND YES TURBO AS LONG AS YOU THINK YOU CAN HANDLE IT!!! I want to get a 370z next year after I'm out of army basic training where would be the best place to get one? what is the right price on a 2010 370? I'd check out autotrader.com to find pricing for both private party and dealerships. Then use NADA and KBB guides to see how realistic everyone is being.